As is usually the case with people that have views such as yours; you haven't read, so you don't know. Your views mirror mine as well when it comes to giving the store away to people that have not taken the time to provide for themselves. I was in one stupid war that cost even more lives than this one (Iraq) - Viet Nam. I regretted not ever saying anything about it during my time in service... I have survived to talk about it though. When it comes to the notion that everyone on welfare is a crack head... You don't know that everyone using public housing and food stamps is a crack head. You assume the worst because that is what you have been told. You speak of rights, but then you don't want to give other people the same rights that you preach about. You talk about one word that I misspelled (liar) and you attempt to degrade me with that as the point of your argument - educate yourself as to what really is happening around you before you make a fool of yourself. You never mentioned one thing about the real things that I discussed with you, obviously because you know they are the truth and you can't refute them. Ask your brother if he still believes that there were WMDs in Iraq. In case you haven't heard - They never found any WMDs, and that is because Bush lied about them being there. I know that there were never any WMDs in Iraqi because I handled nuclear weapons for twenty years in the U.S. Navy - Submarines. Nuclear weapons are not easily hidden because of the 'gamma ray' trail that they leave when moved from place to place. You would know that if you were as informed. I am a Viet Nam veteran - I protected this country just as your brother did; I did it for twenty years! I don't live in the United States anymore. I took my money out of U.S. banks. I sold my houses, land and divested myself of everything that I owned in America because I knew that Bush's practices would bring down the economy there. 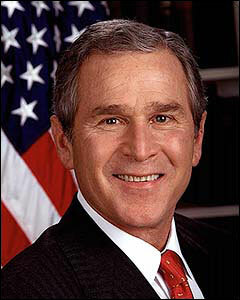 Bush was given the reins to the country with 1.3 trillion dollars in the Bank. He promptly spent it on tax cuts for the rich. I got 27 thousand the first year of those tax cuts... what did you get - probably 600 hundred dollars like all of the rest of the people? Only the rich (I am far from rich) benefited from that tax cut. You can't pay the nation's bills if you are giving away the nation's money sweetie... that is why we are in a hole. What did Obama get when he took over from Bush... two wars that Bush lied to get into and did not clean up. A prison full of Al Qaeda that has yet to be tried… a national debt bigger than ever before… an economy that is in shambles. And then, you have the audacity to blame Obama for the '2.4 trillion' that you said he has spent - most of which has been spent to keep this country from falling apart at the seams. First of all, I want you to get a life... you are obviously taking advantage of the unemployment that Obama is providing for the likes of you. You are bothering me, secondly! And lastly, if you can't take the time to get involved with what is happening around you, you are as useless as Bush was. Instead of hating so much, use some of that energy to stay informed as to what is really happening in the world around you. You have had your say... and so have I. You can't be convinced otherwise and I refuse to degrade myself further by arguing with someone that simply doesn't care to read and be informed. The person I was having this heated conversation with is typical of what serves as the core Republican constituency. The mantra effect, as applied by Rove, Limbaugh, and Beck, has warped the thought processes of these individuals into believing what they hear and none of what is obvious to the senses of a literate person. To the Republicans willing to give a darn - become informed by listening to more than your 'selected' sources of information. Ask questions of yourself when you read, hear, or listen to political orations. Look behind the curtain to see who is manipulating the puppets that are preaching a point of view. Ask yourself, if the Republican Party ran this country so well, why was it that the State of the Nation that Obama inherited was nowhere near what it was when Clinton left office. Clinton may not have been a model President when it comes to morality, but he sure didn't misuse the office of President to the point where we suffering as we are today - it took a drunk to do that. Before you start blaming Obama for everything that is happening, remember the condition of this country when he took office. Few of you can even comprehend how close to economic collapse this country was. History will show that if there are no checks and balances in what we do - the speed of electronic data will find and utilize the loophole a million times over before it can be corrected. That is why you can't say 'NO' (nonsensical obstinacy) to everything that is presented before Congress to correct the problems that we are discovering. Remember - if you are not part of the solution, you are part of the problem!